OPTIONAL EXTENSION - We are offering an optional 4-day extension to this trip for £500. This will attempt Nevado Chachani an easy 6000m peak nearer to Arequipa. For costs, details and dates see below or click here. Based out of the city of Arequipa in southern Peru, this expedition will attempt new routes on some of the remotest peaks in this part of Peru. After an initial two nights in Arequipa to acclimatise we will travel to Chivay in the Colca canyon for a couple more nights acclimatising. While here we'll visit the famous viewpoint which gives unparalleled views of condors soaring in the early morning sunshine. The peaks we plan to attempt are ones we saw from close up during a long exploratory trip in southern Peru in 2015 and are in the general area of Lake Titicaca. However due to the nature of this expedition we cannot disclose the exact names of any peaks and/or routes we will attempt until we receive a booking form and deposit. On receipt of these we will issue a further information sheet giving details of the routes and the peaks we intend to climb. The routes we are looking to climb are expected to be relatively easy climbing ascents. These will be mainly on rock with just small amounts of snow and around about alpine AD in difficulty. The peaks are in the range of 5000-5400m high. A high standard of fitness is always required for ascents over 5000m, but we don't anticipate this trip being unduly arduous. While previous experience of winter or Alpine climbing would be useful it is not essential. However prospective clients must have at least some summer rock climbing experience, including at least a little multi-pitch experience and some previous experience of abseiling (rapelling). We have run similar first ascents trips in various parts of southern Peru in 1999, 2002, 2003, 2005, 2006, 2007, 2013 and 2015. All of these provided interesting climbing at an easy standard and successfully completed either new routes or first peak ascents. Highlights of these trips included the first ascent of the south ridge of Alccachaya 5768m, in 2006, and the first ascent in 2005 of the east glacier on Chichicapac 5614m F and the first ever ascent of Chichicapac SE, PD. In previous years we also climbed the south face of Palomani Grande 5723m, PD, the SE ridge of Ananea 5853m, PD, and first ever ascents to the summits of Ritipata Oeste, AD, and Palomani Tranca Central c.5630m, AD. 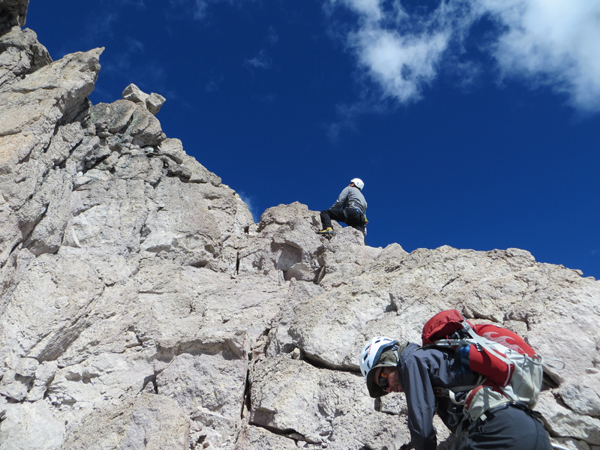 Most recently we climbed the north ridge of Cerro Huaytane, 5435m in the Cordillera Huanzo. See our Firsts page for photos and more details. Days 3 Day in Arequipa. Day 4-5 In Chivay, further acclimatisation. Day 15-16 Travel back to Arequipa and home. Day 19-20 Flight home from Arequipa. Condors at the Colca Canyon, 2015 "First Ascents" expedition. Arequipa is a pleasant and relatively prosperous city in southern Peru, and the nearest place we can fly into. It sits in an oasis at 2300m at the foot of the active volcano El Misti. 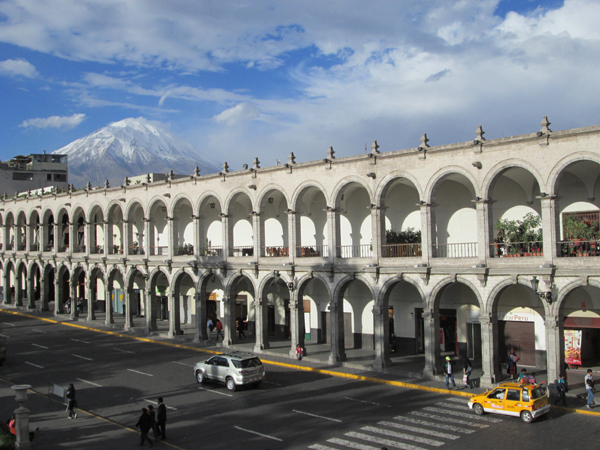 There is a particularly beautiful Plaza de Armas, with Volcan Misti forming a stunning backdrop. Our usual hotel is located right on this plaza. The nearby Colca canyon is a popular tourist destination - it is famously regarded as the deepest canyon in the world and is one of the best places in the Andes to see condors. 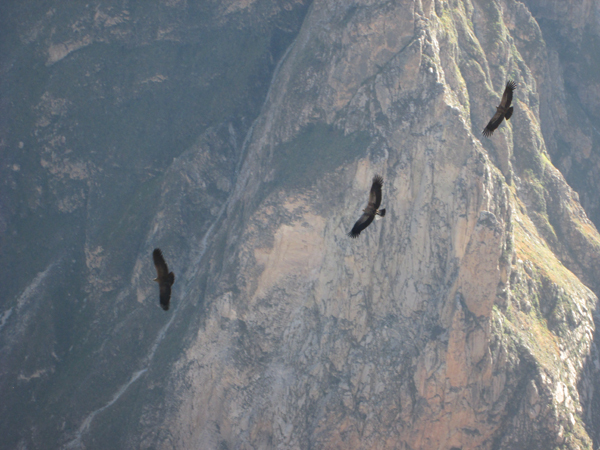 We will spend an acclimatisation day and two nights in the town of Chivay in the Colca canyon on our way to the mountains, and are sure to see condors on this part of the trip. The volcano El Misti seen from the beautiful plaza in Arequipa. For obvious reasons we can't give too many details away about the peaks we intend to climb until we receive your booking form and deposit for this expedition. They are located in the area between Chivay and Lake Titicaca in southern Peru and are relatively near to a road, so we'll use a 4x4 to approach to within a half days walk of our base camps. The peaks are moderately technical (up to about Alpine PD or AD, or rock climbing to about V.Diff or Severe), generally very rocky with not much snow, and a bit over 5000m high. The valleys where we will camp have been glaciated in the past and many small and scenic lochs remain behind. Most of the foothills and valleys are still used as pastures by the Quechua speaking Indians and we are sure to see llamas and alpacas grazing. We are also likely to see some interesting wildlife, mammals such as the vicuña and many species of birds such as condors, andean geese and hummingbirds. We will supply a further information sheet with more details about the peaks we plan to attempt to customers who have paid a deposit. Please phone the office if you'd like to discuss the nature of the peaks we plan to climb, or the trip in general, before booking. We are offering an optional 4-day extension to this trip, when we will attempt Nevado Chachani a 6000m peak near Arequipa. Chachani is basically a long days walk from a high vehicle based camp at 5000m. The ascent is largely on scree and rock but with an ice-axe and crampons normally necessary higher up. Before heading to this peak we will have a rest day in Arequipa. With this extension the expedition is 20 days long and runs until the 16th August (return home overnight 15th/16th August). The cost of this optional extension will be £495 per person with expected extra costs of around £200. We'll need a minimum of two clients booked to run the extension at this price. On the summit of Chachani, optional extension to June 2015 trip. This time of year is the start of the dry season in the Peruvian Andes and there are long periods of stable weather with fewer and less severe storms than the Alps have in a normal summer. There are sometimes high winds at altitude and light snow flurries. Temperatures at altitude are extremely cold, going down to -10ºC during the 12 hours of darkness each night, so bring a warm sleeping bag and a good book! Ascents to over 5000m require considerable fitness. Good hillwalking/mountaineering fitness and stamina is important, but for high altitude expeditions clients also need good cardiopulmonary (heart and lung) fitness. This can only be maintained by a program of intensive exercise such as sprinting, squash, circuit training or sprint cycling. This should be done in small doses (e.g. half an hour every other day) over a period of at least three months prior to your expedition. Without this training you are unlikely to get to the summit. The trip will be partly donkey/porter supported but there are several days on the itinerary when we will need to do a few hours carry to a high camp, or descent to the 4x4 with backpacks. Cold nights, early starts and dehydrated food are a few of the experiences which will have to be enjoyed. For the ascents we have planned on this expedition previous experience of rock climbing and abseiling is essential, although you do not need to have extensive experience. It is difficult to predict the exact difficulty of the climbing we'll encounter due to the nature of the trip but we're expecting to climb routes at no more than V.Diff or Severe on rock (US 5.2-5.4 or Alpine PD or AD). Any small snow and ice sections we encounter should be very straightforward and so previous experience of winter climbing is not essential. 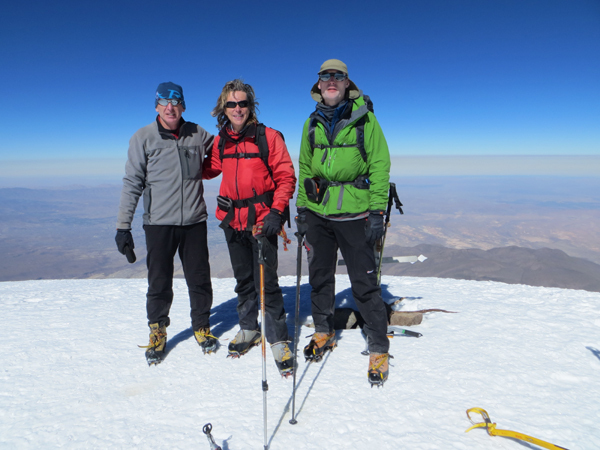 Climbing at 5400m on the Andes "First Ascents in Peru" trip, 2015. Our expeditions are designed to be small and flexible. The expedition will be co-ordinated, organised and lead by us, but we will consult and involve you when planning the details of the expedition. Please note however that the leaders decision is final where the safety of the group or any member is in jeopardy; for example where retreat or diversion is necessary due to illness or bad weather. The maximum size of the expedition will be three customers plus leader. 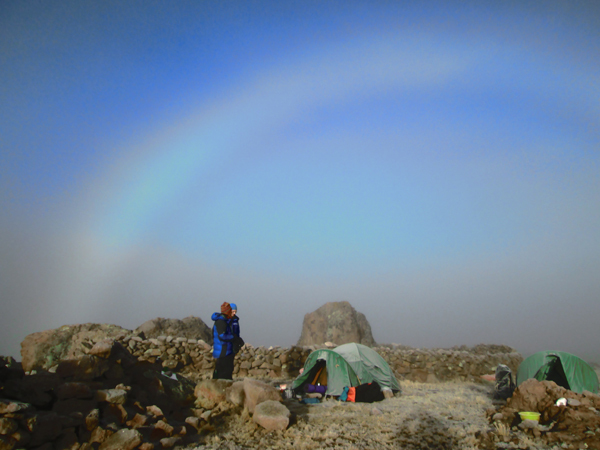 An early morning fog-bow at our campsite, June 2015. Remoteness : You will be several days away from professional medical help for much of the time. There is no chance of a helicopter rescue. Mountain Hazards : In certain places you may be subjected to a risk of rockfall. There will be some technical climbing on at least some of the ascents, and therefore the usual hazards associated with climbing and abseiling. 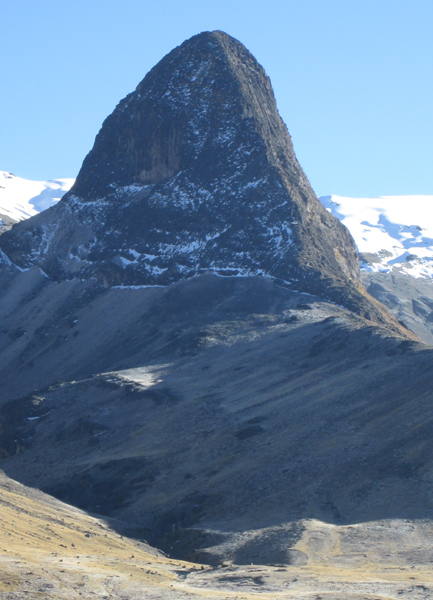 One of our main targets is this unclimbed 5000m+ rock tower in southeast Peru, not so far from Lago Titicaca.